According to Dr David Viner, a ‘senior research scientist’ at the climatic research unit (CRU) of the University of East Anglia, within a few years winter snowfall will become “a very rare and exciting event”. “Children just aren’t going to know what snow is,” he said in March 2000 Read the full quote here. Too much snow closes California, Nevada, Oregon ski resorts. up-to 2.5m of snow in Scandinavia. Eurasian autumn snow cover has increased 50% since 1979, the exact opposite of what the experts predicted. 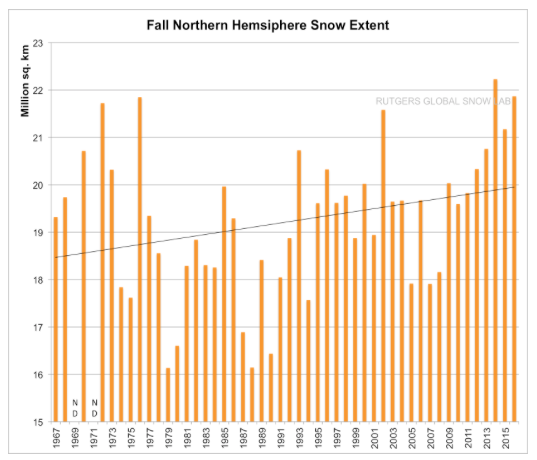 Autumn snow extent for the entire Northern Hemisphere has also been increasing, and set an all-time record in 2014. 2012 Brenner Pass, one of the principal mountain passes of the Alps, was closed due to the snow. Greenland has been gaining about 3 million tons of snow/ice per day since 1st September 2015 (details). Dr Viner must be thinking of another planet, but defiantly not this one.